Ben Marcantonio currently serves as the President and CEO of Hospice of the Chesapeake. He joined the organization in April 2013 as the Chief Operating Officer and was promoted to Interim Chief Executive Officer in January 2015 and officially was appointed in September 2015. Marcantonio leads all aspects of the organization with a focus on providing the highest quality care and experience for patients and their families. Marcantonio is also responsible for the implementation of strategic plan and all fundraising activities. 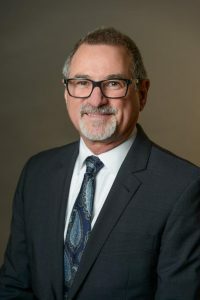 Marcantonio relocated to Maryland in April from San Diego, California and has 25 years of leadership experience in educational, healthcare and social service settings. Prior to relocating, Ben served as Chief Administrative Officer at San Diego Hospice and The Institute for Palliative Medicine. He has an extensive background in working with multidisciplinary clinical and management teams in a variety of educational and clinical settings. He holds a Master’s of Science in Counseling from San Diego State University, a Master’s of Education in Administrative Leadership from the University of San Diego, and a Bachelor of Sacred Theology and Philosophy from the Gregorian University in Rome, Italy.